Entries tagged with “Rust & Vrede”. On 23 September Eat Out will announce its Top 10 Restaurant Awards list of twenty finalists. Ten of these will be chosen by three judges (Abigail Donnelly, Peter Goffe-Wood and Arnold Tanzer), and announced at the Eat Out 2010 Restaurant Awards gala dinner at the Westin Grand Hotel on 28 November. To live up to my reputation in having been nominated for the SA Blog Awards in the “Most Controversial Blog” category, I have done a prediction of some of the Top 20 Restaurants we might expect on the list, as well as those that will fall off the list, in my opinion. 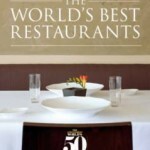 I have also predicted which restaurants will make it onto the list for the Eat Out Restaurant Awards 2011. It is important to note that Eat Out specifies that a chef must have been with a restaurant for a year, to be selected for consideration for this prestigious award, the “Oscar” of the Restaurant industry. 5. Restaurant Christophe, Stellenbosch (chef Christophe Dehosse): no glitz or glamour in terms of its interior, yet the Spookhuis is steeped in history. Christophe is charmingly French, and is a hands-on chef both in the kitchen and inside the restaurant. His food is excellent. 7. Jardine’s on Bree Street, Cape Town (chef Eric Bulpitt): Eric is cooking at the Awards’ dinner, so an automatic Top 10 candidate. He is also about to return from Copenhagen, where he spent 6 weeks in the kitchen at Noma, to gain inspiration. Noma is the top restaurant of the Top 50 restaurants in the world. 8. Jordan’s Restaurant with George Jardine, Stellenbosch (chef George Jardine) – last year’s move to his new restaurant at Jordan Winery no doubt cost George Jardine a place on the Top 10 list, a shock, as he had been number 2 on the list the year before. He had announced the move to Stellenbosch for personal reasons, and the judges had clearly taken this into account. George Jardine has been on the Top 10 list for a number of years, whilst at Jardine’s. George Jardine’s food preparation is excellent, but as at Jardine’s, the restaurant interior leaves a lot to be desired. 10. Terroir, Stellenbosch (Michael Broughton): Terroir has won numerous Top 10 awards, and seems to be a favourite of the judges. 11. The Tasting Room, Franschhoek (chef Margot Janse): the restaurant seems to have a love/hate relationship with Eat Out, in that it was left off the Top 10 list for three years, from 2004 – 2007, and that it had to endure the humiliation in sharing 10th place with Overture on the Top 10 restaurant list last year (a first for Eat Out in having a joint winner), indicating that the judges did not want to offend any of the two restaurants, but it became an insult to both restaurants instead. This created a Top 12 Restaurant list in reality, and the judges will be sure to not lose face to make compromise selections again this year! The interesting contrast is that the restaurant has featured in the Top 50 Restaurants in the World list, but for the first time another South African restaurant overtook it, La Colombe making it to an unbelievable 8th place on the international list. 12. Grande Provence, Franschhoek (chef Darren Roberts): Chef Darren is a highly talented chef, and has been around the block for 20 years in South Africa alone, but has been sadly neglected by Grande Provence’s Marketing department. He has just returned from a week cooking at the Grill Room at the Hong Kong Country Club, one of the most exclusive eateries in the city, sharing his menu and the wines of Grande Provence. (POSTSCRIPT 21/9: Chef Darren says that his restaurant is not eligible for the 2010 Awards, as he only started in January, therefore not giving him a full 12 months at the restaurant, a requirement for the Awards). 13. A Durban restaurant – to not be seen to show Cape Town and the Cape as the center of the cuisine universe, a restaurant from this city is normally selected by Eat Out. The choice of 9th Avenue Bistro has raised eyebrows for its inclusion in the Top 10 list in the past, especially for its location in a parking lot. The owner/chef appears to have left in the past year. 14. To be politically correct, a Johannesburg restaurant also needs to be on the Top 10 list. Roots at the Cradle of Humankind has been a winner for a number of years. Other potential Top 20 short-listed restaurants could include The Restaurant at Waterkloof in Somerset West, Bistro 1682 at Steenberg, Delaire restaurant at Delaire Graff, 95 Keerom Street (see why for Carne below) and Bosman’s at Grande Roche (once the top restaurant in the country, but it has been left off the shortlist for so many years now). 1. Reuben’s in Franschhoek – winning Top Chef and Top Restaurant in 2004, Reuben’s has not made it back on the Top 10 list since 2006. Too many service-related complaints have dogged the restaurant, and Reuben will have to make sure he does not stretch himself too thin when he takes on his biggest challenge yet at the One&Only Cape Town from October. 2. Carne was on the Top 20 list last year, and fortunately for Eat Out they did not select it to the Top 10 list, given our disclosure of the restaurant’s dishonest claim that all its meat is from its Karoo farm and is organic. Carne has since removed this claim from its website. However, owner Giorgio Nava is a most charming and determined man, and has a close relationship with Eat Out editor Abigail Donnelly, who refused to respond to our allegations about Carne’s claim, even when it was proven to be correct! I therefore predict that 95 Keerom Street will receive a ‘consolation’ Top 20 nomination in its place. 3. Cape Colony at the Mount Nelson Hotel – Chef Rudi Liebenberg made the Top 20 list two years running, whilst at The Saxon in 2008, and the Mount Nelson in 2009. It is unlikely that the restaurant can make the Top 10 list, given that it is undergoing a major renovation as well as a re-invention of its menu currently, and will only open again in November. 4. Salt restaurant – coming to the restaurant at the Ambassador Hotel in Bantry Bay, from Grande Provence, for which he received a Top 10 listing, chef Jacques de Jager’s presence is so low key at Salt that I regularly phone to check if he is still there. His wonderful cuisine hand one knows from Grande Provence does not seem to have made the journey to Cape Town yet, in that his menu and the food quality is disappointing! 5. La Colombe – given that ex-chef Luke-Dale Roberts has moved to a consulting role at La Colombe, it is unlikely that the restaurant should make the Top 10 list. This is re-inforced by Luke’s announcemnet (on 20/9) that he is to open his own restaurant The Test Kitchen at the Old Biscuit Mill in Woodstock in November. 1. 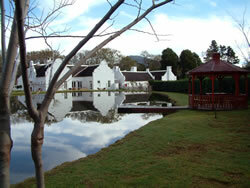 Pierneef Ã La Motte at La Motte in Franschhoek – wow, wow, wow, and that was only after having been open for 2 days! Top 10 for 2011 for sure. 2. Indochine at Delaire Graff– I thought that the original Delaire restaurant would make Top 20 this year when I first visited it a year ago. But it has lost many staff members, including a talented sommelier and Maitre’d, and service and food reports are not as positive as when it opened. The new sister restaurant Indochine has great potential, and could make the Top 20 list in a year. 3. 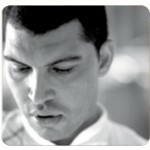 Richard Carstens opens at Tokara Restaurant next month, and has been an Eat Out Top 10 chef six times. Hopefully he has staying power to last a year at the restaurant. 4. The Bombay Brasserie at The Taj hotel. 5. Reuben’s at the One&Only Cape Town – this is a ‘grown-up’ and sophisticated Reuben’s, yet has some of Reuben’s favourite dishes, such as calf’s liver. 6. The Test Kitchen at the Old Biscuit Mill, Woodstock – given that Luke Dale-Roberts has been named the world’s 12th best chef in the world in 2010, this is a no-brainer for his new restaurant, set to open in November! 7. Grande Provence does not qualify for the 2010 Awards, as Chef Darren Roberts has not been at the wine estate for a full 12 months. He would be a natural candidate for the 2011 Top 20 shortlist. POSTSCRIPT 15/4: It has been announced that David Higgs has resigned and will leave Rust en Vrede in mid-June. Christophe Dehosse is a passionate owner of his new Restaurant Christophe in the ‘Skuinshuis’ on Van Reyneveld Street in Stellenbosch, adding further weight to the prediction that Stellenbosch will soon wear the crown of the gourmet centre of South Africa His restaurant joins an illustrious collection of restaurants in this Winelands town, which includes Rust en Vrede, Overture, and Delaire Graff. The restaurant opened a month ago. Dehosse first started cooking at Chamonix in Franschhoek, then was the chef at Au Jardin in the Vineyard Hotel, and moved to Joostenberg Deli nine years ago to join the Myburgh family he has married into, running a good value for money lunchtime restaurant there. While he was very low key at Joostenberg, JP Rossouw of Rossouws’ Restaurants awarded the restaurant his highest rating of 3 stars, awarded to such greats as Reubens, La Colombe, and Rust en Vrede. Le Quartier Francais did not even make his 3-star grade. Christophe speaks with a delightful French accent, and epitomises the French chef. What reflected his passion was that he spent more time with the patrons, after having done all the main courses, chatting at length at their tables, something rarely seen in restaurants these days. He even takes the bookings during the day. Chef Dane Newton of Allee Bleue also understands the art of connecting with his clients. While his wife continues at Joostenberg, Christophe has set up in the building which also houses a coffee shop, and a decor shop. The transformation of the part of the building that he uses is almost unbelievable. It is a two-room restaurant, the entrance section having three tables and the other section almost three times in size, giving the restaurant the choice of where to seat the guests. Christophe proudly compliments interior designer Liesel Rossouw for the understated yet chic interior. 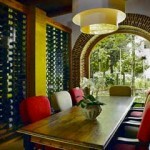 The subtle green walls, tastefully decorated with beautiful works of art which can be bought, and shocking pink and orange chairs (with 5 colour variations) made from wine barrels especially made for the restaurant to give patrons a comfortable seat during the meal. The lamps are unusual too â€“ they are made from woven laminated ads, creating an unusual effect. A simple metal structure serves as the desk at the entrance â€“ slick and simply designed. It having been a 42C day, and still hot at mid-30C in the evening, all patrons chose to sit outside. The tables were beautifully laid with white tablecloths, silverware, and glassware, and each table had a fresh rose on it. A lovely flower arrangement, in white and pink flowers, was the first statement the restaurant made on arrival. A single palm tree towers above the courtyard, and an almost wild bougainvilla hedge in shocking pink complements the pink and orange chairs. Darren is the Manager, and he was very friendly in welcoming us, and patiently answered all the questions. 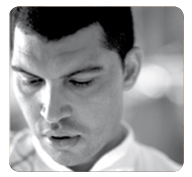 He is from Birmingham, and last worked at Umami in Stellenbosch. He served all the tables. The menu is very simply typed on a piece of paper, and looks unpretentious, and almost contradicts the lovely interior and special food served. It is short, offering four starter choices: quail salad (R 65), seafood salad (R 65), foie gras with Noble Late aspic (R130), and marinated vegetables and goat’s cheese (R 50). The foie gras was outstanding, and a surprise was the complimentary glass of Joostenberg Nobel Late Harvest, served well-chilled with it. Five main courses were Cape Salmon (R 95), yellowtail (R 95), Bouillabaisse (R 110), beef fillet (R 135), and roast duck jambonette (R 110). The steak was pronounced to be excellent, while the duck was disappointing, probably due to a duck lover’s experience of ˜roasted’ being different to that served. The dessert choice costs R 45, and was apricot and almond tart, chocolate biscuit, and chilled fresh fruit soup, which would have been ideal for such a hot evening, but space did not allow it. A cheese selection is available at R 60. The fruit soup was a berry berry nice lunch the following day. The menu changes every two weeks. The winelist is equally printed on white paper, and is unlikely to win a mention in the Diner’s Club winelist awards as far as presentation is concerned. It is very understated, yet offers a good selection of South African and even some French wines. A full page is devoted to sparkling wines, Graham Beck supplying the least and most expensive bottles, at R 150 – R 290. It can also be ordered by the glass, in a price range of R 22 – R 35. The Joostenberg wines appear in almost every category, as does a brand not commonly known, called MAN, named after three Myburgh ladies: Marie, Annette and Nicky. Jose Conde’s wines also feature on the wine list, as do Thelema (R 600 for Cabernet Sauvignon) , Klein Constantia, Kanonkop (Pinotage at R 480), Veenwouden (Merlot at R 420), Hartenberg (Shiraz at R 490), Hamilton Russell (Chardonnay at R 350), Paul Cluver, Simonsig and Villiera. Restaurant Christophe, Skuinshuis side entrance, Van Reyneveld Street, between Nook Eatery and the synagogue, Stellenbosch, tel 021 886-8763. On the Stellenbosch Restaurant Route. 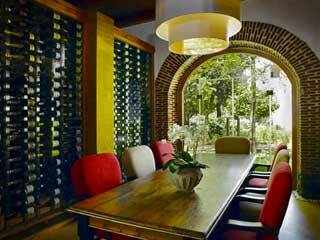 POSTSCRIPT 23/9: Restaurant Christophe has been named a Top 20 Eat Out Restaurant Awards finalist. One of South Africa’s Top 10 restaurants, Rust en Vrede, did a special dad’s 94th birthday celebration proud on a weekday night 2 weeks ago, just four days after it was announced as 3rd place winner on the Top 10 list, as winner of the Service Excellence Award in the Eat Out Top 10 Restaurant Awards, and a week after it was named the best Restaurant in the winelands in the world, by the Great Wine Capitals Network. A terrible drive due to after-hours roadworks near the airport made the journey from Cape Town doubly long. The arrival at the wine estate wiped away the frustration, it being dark already, and the lighting romantically showing off ancient oak trees and a beautiful garden. A staff member stood outside the door to welcome us, and we were taken to the rest of the party, having a drink on the terrace outside. Our table for 6 was set apart from the rest of the restaurant, in its own alcove, two sides filled with wines on glass shelves. This gave a feeling of privacy, yet one felt to be part of the restaurant. The menu and winelist covers were one of the few aspects to criticise, looking like plastic “mock-croc”. The menu is informative, with a foreword by Jean Engelbrecht, the owner of the wine estate, David Higgs the chef, and Neil Grant, the sommelier. The menu is simple – one has two choices – 4 courses at R 400, or 6 courses at R 550 without paired wine, or R 800 with wine paired per course. The only catch is that all persons in the party must have either the 4- or 6-course meal. As the 4-course meal allows one an option of three choices per course, our party chose this option. A first course choice offered was a scallop “gazpacho” that was not a soup at all, foie gras and cherries, and sweet onion soup. The second course choice consisted of a salmon trout, organic chicken, and fennel and creme fraiche risotto. The third course offered tuna, loin of lamb and springbok. The 4 th course choice was between goat’s cheese and melon, strawberry and nut parfait with marzipan, and baked apple and pastry with cream cheese ice cream. The 6-course meal starts with tuna, followed by scallop, rabbit, Chalmar beef, Tetede Moine and ends with Chocolate Marquis. No options are provided within each of the 6 courses. The menu also contains the supplier information, looking a little like an add-on to the otherwise slick menu. Beef and venison come from the estate’s Kalahari farm, herbs come from the estate’s herb garden, Magic Steve supplies the vegetables, The Wild Peacock supplies ingredients, duck and rabbit, Neil Jewel the chacuteries, and Wayne Rademeyer from Wellington the Buffalo Mozzarella. Reubens is the only other known restaurant which states its suppliers in its menus. The meal was preceded by an amuse bouche of scallop. As each dish is brought to the table per course, the waitress reminds one of the choice one ordered, pointing out what is on the plate. She explained everything so well and efficiently, that everything seemed to taste even better. The winelist reflects about 270 wines on 28 pages, and a neat index at the start of the winelist categorises the wines on offer, and an easy reference to the page. An oddity is the fact that only Champagne is served, and that South African Cap Classiques are not available. This is justified in the menu on the grounds of David and Neil being fanatical about the Champagne region in France! The winelist has 24 Champagnes, ranging from R 500 for a Mailly to R 1 800 for a Laurent Perrier. Wines by the glass are available, at R 30 for a Cederberg Chenin Blanc to R 50 for a Fryer’s Cove. Similar to The Big Easy, a Portfolio of Wines is referred to in the winelist, and all wines from Rust en Vrede, Cirrus, Guardian Peak, Ernie Els, and Engelbrecht Els are listed separately in the winelist. The Rust en Vrede wine offering is extensive, and a separate price is quoted for each vintage. So, for example, the Rust en Vrede Merlot ranges from R 200 for a 2008 to R 900 for a 1989, the shiraz from R 230 for a 2006 to R 750 for the 1992, and R 95 for a Cab blend. Other wine brands are offered as well, and the Meerlust Rubicon costs R 350, and the Schalk Burger costs R 700. A Pol Roger bubbly was followed by the Rust en Vrede Shiraz, and was decanted by Neil. So professional is the wine team that when a second bottle of the same Rust en Vrede Shiraz was opened, a new round of Riedel glasses was brought to the table. The spacing of the serving of the four courses was just right – not too slow nor too fast, and one lost track of time, not necessarily a good thing on a weekday evening! Service is unobtrusive, polite, reserved, and no proactive conversation is made – all communication relates purely to the meal and the drinks. An interesting but professional looking touch is the pouring of the bottled water with a cloth, to prevent the bubbles from wetting the guest or the tablecloth. This has not been seen anywhere else ever. Unusual too is the multi-gender bathrooms – one does not expect to see a gentlemen coming through the door! Molton Brown bathroom products are available, being of a very good quality. What was missed relative to a visit a year ago was David Higg’s regular visits to the table, after each course, to check on the guests’ satisfaction with and feedback about each course. David appeared more hands-on in the open-plan kitchen than a year ago, and would not have had the time to do so. He did come to chat after the meal, and impresses with his modesty, charm and gentleness. Even more commendable is the pride and dedication to his restaurant – if he should be ill, or is travelling, he closes the restaurant, he said. He will not allow it to operate without him being present. This places a huge burden on him in the five nights a week that the restaurant is open, but ensures consistent service – David Higgs probably is the only chef in the country to take his craft and reputation so seriously. A small irritation, which Rust en Vrede shares with almost every restaurant in the country, is a bad habit of staff stretching past one from the left to place a knife or spoon on one’s right. This was the only aspect of the service that can be faulted. The music is nondescript and irritating, and sounds too canned – it is not well-matched to the decor, and quality of the food and wine, and does not add to the ambiance. Smoking is strictly forbidden on the estate, but an exception is made for cigar smoking when one is outside with no one else present, the cigars are for sale on the menu! The 4-course meal for 6, a bottle of Pol Roger champagne, 2 bottles of Rust en Vrede Shiraz, some pre-dinner drinks, cigars as well as the mandatory 10 % service charge for a table of 6 came to R 4 700. The birthday boy received a tiny chocolate cake to take home, and each guest receives a roll wrapped up as a “gift”, an oddity, as rolls are not served with the meal, when one leaves. POSTSCRIPT 9/4: Sommelier Neil Grant tonight telephonically denied the rumour on Twitter that David Higgs is leaving Rust & Vrede and moving to Johannesburg in June. POSTSCRIPT 15/4: It has been announced that David Higgs has resigned, and is leaving Rust en Vrede mid-June. John Shuttleworth will step into David’s chef’s shoes. Rust en Vrede is open from Tuesday to Saturday evenings. During the day one can enjoy only one dish – steak and chips – for lunch. Bookings are not taken for lunch. 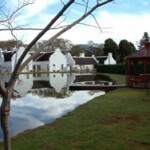 Tel 021 881 3881, www.rustenvrede.com. On the Stellenbosch Restaurant Route. Sixteen of the 20 finalists on the Prudential Eat Out Restaurant Awards list, from which the Top 10 list will be selected at the Awards function on 22 November, are from Cape Town and the Western Cape, proving that the Cape is the Gourmet Centre of the country. Eight finalists are from Cape Town alone, four are from Franschhoek and three are from Stellenbosch. The three Stellenbosch finalists all made the Top 10 list last year – Terroir, Overture and Rust & Vrede. Franschhoek’s finalists are Reubens (Top Chef and Top Restaurant winner five years ago), The Restaurant at Grande Provence, Bread & Wine, and The Tasting Room at Le Quartier Francais (the only current Top 10 restaurant in Franschhoek). All the Franschhoek finalists have been previous Top 10 winners. New entrants to the Top 20 list, having been open for more than a year, are Carne, The Greenhouse at The Cellars Hohenhort, and The Roundhouse, all based in Cape Town. All other finalists were finalists last year as well. Finalists of last year that did not make the Top 20 list this year are The Showroom (closed down earlier this year and now houses Portofino), Myoga, The Saxon (chef Rudi Liebenberg has moved to The Mount Nelson Hotel) and Linger Longer. Restaurants opening up a storm! Following on from the restaurant opening news posted on the WhaleTales blog less than a week ago, more restaurant opening (and temporary closing) news has reached WhaleTales. Reuben Riffel, who opened a small 30-seater restaurant in Robertson last month, has two new babies up his sleeve – he and his wife Maryke are expecting the birth of their first child in the next week. He is also planning his next restaurant opening, in the old Pippin farmstall building at the entrance to Franschhoek, alongside the Franschhoek Cellars, focusing on steaks. Reuben’s has a new attractively designed menu, in A3 size, listing his starters (expensive in ranging from R 58 – R 75), mains ranging from R 89 – R 145, and desserts expensive in ranging between R 50 – R 70. Interestingly, his new menu has a listing of the who’s who cooking in the kitchen, with Reuben listed as the “Concept chef”, and his executive chef as William Carolissen, his commis chefs as Luzette Riffel and Lizel Blanckenberg, and his pastry chef as Corien Hattingh. Unfortunately this can only mean that Reuben will be less likely to be in the kitchen himself. The duck liver starter especially, but also the calf’s liver main course, were excellent last night, and the service good. The only complaint was that a vintage of Lynx wine by the glass stated on the winelist was no longer available, and the waiter did not inform the customers about this. He was ready to pour a younger vintage without communication. Adrian Buchanan, who was the chef at Monneaux restaurant at the Franschhoek Country House for many years, has recently opened a restaurant with two partners at Freedom Hill Country Restaurant on the road between Paarl and Franschhoek, near the Wemmershoek Dam. In Franschhoek Allee Bleue will be a space to watch, with ambitious plans for two further restaurants to open on the estate in the summer, in addition to its Bistro. The estate has re-opened for weekend dinners and brunches. It has also just introduced picnics 7 days a week, at R 145 per head, with delicacies such as avocado ritz, snoek pate, roast beef, and chocolate mousse. The Bombay Bicycle Club, which has a namesake in London, but is no relation, opened recently where Amigos used to be at the top of Kloof Street in the City Bowl, and Richard Griffin, previous owner of the liquidated Madame Zingara, is one of the partners. The opening and his involvement have been very low key. The restaurant is booked out up to 3 weeks ahead over weekends, yet has received less than favourable feedback on restaurant review websites. Chenin has opened as a restaurant and a wine bar where The Nose Bar used to be in the Cape Quarter, with chef Daniel Heyns, previously with Zevenwacht and ZeroNineThreeTwo, reports EatOut. In Sea Point, two restaurants have opened: La Boheme on Main Road, and Duchess of Wisbeach, on Wisbeach Road. Reviews will be posted on the WhaleTales blog shortly. Not much is known yet about the projects that chef Bruce Robertson is consulting on, but they are said to be a new restaurant each in Woodstock and in Franschhoek. Just six days ago, WhaleTales wrote how the financial shenanigans of Conrad Gallagher had affected the business of Bouillabaisse and Crepe Suzette in the Rockwell Center in De Waterkant. Its unfortunate location, in being hidden from view from Somerset Road, and the demise of the promised epicurean food market in the Centre, severly impacted on the business of the two restaurants, with the Main Ingredient newsletter just 2 weeks ago writing a denial by Bouillabaisse that it was closing down in Cape Town. Today the restaurant sent an e-mail to its database, to say that both restaurants have closed in Cape Town, and are relocating to an undisclosed address in Cape Town, re-opening in November. The Bouillabaisse website also carries the news, and the restaurants’ telephone rings through to a Telkom answering service. Jean-Pierre Rossouw, compiler of ‘Rossouw’s Restaurants’ guide, has just published his 2009 edition, and awarded 3-stars, his top rating, to 13 restaurants in the country. The Cape-based 3-star restaurants, according to the Weekend Argus, are Aubergine, Bosman’s, Ile de Pain, Jardine, La Colombe, Magica Roma, Mariana’s, The Tasting Room , Rust & Vrede and Zachary’s. Other 3-star restaurants are Butcher Shop & Grill and Thomas Maxwell Bistro in Sandton, and Ritrovo in Pretoria. Interesting omissions are Overture, the scenic restaurant of Bertus Basson on the Hidden Valley Estate and close to Rust & Vrede, and Terroir, outside Stellenbosch, both restaurants being on the Top Ten Eat Out list. In his previous edition, Rossouw was demeaning to Overture about its driveway being very steep, which is absolute nonsense, and should not have clouded his judgement of the restaurant! 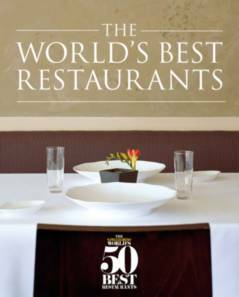 Le Quartier Francais in Franschhoek and La Colombe in Constantia have both been selected on to the S. Pellegrino World’s 50 Best Restaurant Awards list, being ranked in 37th and 38th position, respectively, reports Bloomberg. The awards were presented two days ago. Top honours have once again gone to El Bulli on the Costa Brava, at which chef Ferran Adria is renowned for his unusual food preparation. He has held the top position for three years in a row. He recently visited Cape Town, and spoke about his passion for cooking. Surprisingly Heston Blumenthal’s The Fat Duck retained its second place for the fourth year running, after having closed for more than a month earlier this year when hundreds of its patrons became sick after eating at the restaurant. Nobu, which has also opened in the One&Only Cape Town, came in at 34th position for its UK restaurant. Eight French restaurants are on the Top 50 list. Noma in Copenhagen won third place, having been at tenth place last year, and its chef Rene Redzepi won the Chef’s Choice Award. The restaurants ranked from 51st – 100th position are also revealed, and the Cape can be proud to have a further three restaurants on the top list, being Jardine at number 79, Aubergine at number 96 and Rust & Vrede in Stellenbosh at number 98. Jardine and Rust & Vrede are on the Eat Out Top Ten list, while Aubergine is not. Given the South African elections taking place today, and a surefire win for the ANC, the restaurant Zuma in China, which made the 51st position, and the Zuma restaurant in London, which came in at number 92, may increase in popularity when Jacob Zuma becomes the President of South Africa next month.